47 Things You Can Do For The Environment by Lexi Petronis. "Teens are strong, creative, and motivated. They're the doers and dreamers. They are also the ones that will inherit the planet. If change is going to happen, it has to start with them." This book has eight chapters or sections, one for each part of your life. At Home, With Your Lifestyle, At School, With Technology, While Shopping, When Traveling, With Friends, and In the Community are the eight sections. Within each section are the everyday events and how to make them greener. Every single one of the 47 ways to change your life has an introduction that sometimes has a joke, but always something that is easy for the reader to relate. Then there is a section on how to do it, like how to throw a party green style. Sometimes there is a green box related to the topic that will tell you how you do not have to stop at recycling paper. A section that readers will find useful was the glossary at the back of the book. Throughout the book Petronis put websites with additional information on a certain topic. For example, you can check your carbon footprint on terrapass.com and tell you how to lower it. Also, at the back of the book is every single website that was mentioned throughout the book. At the back of this book there are source notes to where Petronis found every piece of her information by section. This book is directed toward teens but, it is actually for anyone who wants to learn more on how to help the environment. I rate 47 Things you can do For the Environment five out of five stars. It gives the reader 47 ways to help the environment. We may not be able to stop the rise in temperature, but we can at least slow it down. Lucky Petronis put her sources at the back of the book; the readers are certainly going to want to read more. Review written by Donna (6th grade student). 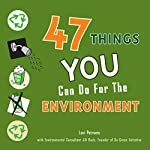 We would like to thank Houghton Mifflin Harcourt for providing a copy of 47 Things You Can Do For The Environment for this review. Have you read 47 Things You Can Do For The Environment? How would you rate it? Sounds like a fun and informative book. Thanks for calling attention to this environmental resource, Donna.